Silverfish are flat insects that are broad near the head, tapering toward the rear-somewhat "carrot" shaped. They are soft-bodied and wingless insects that are covered with scales and have two long, slender antennae at the head and three long, antennae-like appendages at the rear. These three appendages, one directed straight back and the other two curving outward, plus the two antennae, are nearly as long as the body. Sometimes these insects are known as "bristletails." The adult is about 1/2 inch long with a uniform silvery or pearl-gray color, whereas the four-lined silverfish is about 5/8 inch long and the back displays four dark lines the length of the body. The gray silverfish is about 3/4 inch long and uniform light to dark gray. The offspring resemble the adults except they are smaller and the eggs are whitish, oval and about 1/32 inch long. Most often, silverfish go unseen homeowners because they are nocturnal and run swiftly. Occasionally, they are found in bathtubs because they crawl in seeking food or moisture and are unable to climb out. Also within the home they live in damp, cool places (they prefer 75 to 95 percent relative humidity) and as such, are often found in basements, bathrooms, and kitchens. Large numbers may be found in new buildings where the walls are still damp from plaster and green lumber. Outside they can be located under rocks, bark or leaf mold, in the nests of birds/mammals, in ant/termite nests. Silverfish usually prefer vegetable matter with a high carbohydrate and protein content. However, indoors they will feed on almost anything including: dried beef, flour, starch, paper, gum, glue, cotton, linen, rayon, silk, sugar, molds, leather, dead insects, and breakfast cereals. They have mandibles that can remove the sizing of paper in books, and magazines, damaging etchings and prints. They nibble on book bindings and feed on the glue and paste in the binding. Still, though, they are capable of living for up to one year without any food. Silverfish are nocturnal. When objects are moved where they are hiding, they dart out and seek new hiding places. 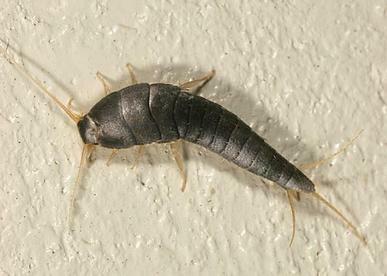 Silverfish follow pipelines from the basement to rooms on lower floors, living in bookcases, around closet shelves, behind baseboards and behind window or door frames. Also, they hitchhike into and around the home in food, furniture, old books, papers and old starched clothing. Adults can live from 2 to 8 years and lay eggs in small groups containing up to 50 eggs. The eggs are very small and deposited in cracks and crevices. A female normally lays less than 100 eggs during her lifespan of two to eight years and under ideal conditions, the eggs hatch in two weeks, but may take up to two months to hatch. The young nymphs are very much like the adults except for size and may reach maturity in 3 – 24 months. After each molt, silverfish must mate if viable eggs are to be produced (a silverfish could molt up to 50 times during its lifespan). Still, however, populations do not build up rapidly because of their slow development rate and the small number of eggs laid, therefore a large infestation in the house usually indicates a longtime infestation.